Pres. Jovenel Moïse greets Pres. Nicolas Maduro during a visit to Caracas on Nov. 17, 2017. 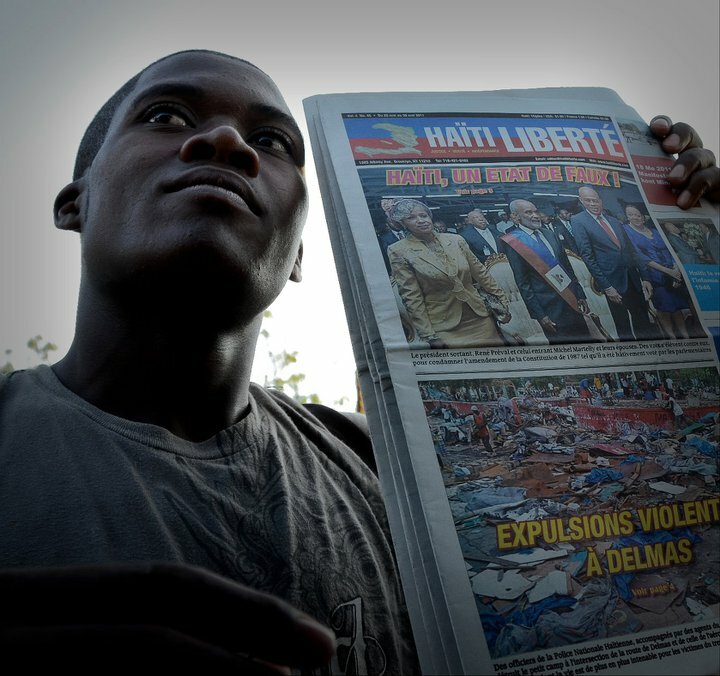 On Jan. 10, Haitian President Jovenel Moïse’s government did the unthinkable. It voted to not recognize the legitimacy of Venezuelan president Nicolas Maduro, who on the same day was inaugurated for a second six-year term after winning the country’s May 20, 2018 election with almost 68% of the vote. 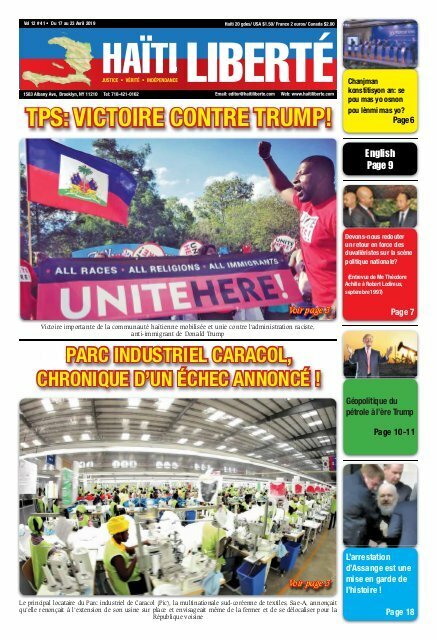 It is the first time that Haiti has voted with Washington against the Bolivarian Republic, which since 2006 has provided Haiti with some $4 billion in oil under the PetroCaribe accord. It is the first time that Haiti has voted with Washington against Venezuela, which since 2006 has provided Haiti with some $4 billion in oil under the PetroCaribe accord. 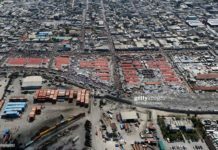 In recent months, massive demonstrations have rocked Haiti, demanding how the Haitian government spent the revenues which it received from the oil’s sale. Under the bilateral accord, Haiti only pays 60% of its oil bill up front, with 40% going to a development fund which Haiti repays to Venezuela over 25 years at 1% interest. This PetroCaribe fund has been mostly squandered and embezzled by the Haitian government, a November 2017 Haitian Senate report found. In the face of government foot-dragging, repression, and continued corruption, demonstrators are now calling for Jovenel Moïse to step down. The vote against Venezuela was taken in Washington, DC at the Organization of American States (OAS), which Cuba calls the U.S. “Ministry of Colonial Affairs.” A resolution “to not recognize the legitimacy of Nicolas Maduro’s new term” was approved with 19 votes in favor (Argentina, Bahamas, Brazil, Canada, Chile, Colombia, Costa Rica, Ecuador, United States, Guatemala, Guyana, Haiti, Honduras, Jamaica, Panama, Paraguay, Peru, Dominican Republic, and Saint Lucia); 6 against (Bolivia, Dominica, Nicaragua, Saint Vincent and the Grenadines, Suriname, and Venezuela); 8 abstentions (Mexico, St. Kitts and Nevis, Trinidad and Tobago, Uruguay, Antigua and Barbuda, Barbados, Belize, and El Salvador); and one absent (Grenada). Since Jovenel Moïse’s inauguration in February 2017, Haiti has gradually turned on Venezuela, although its solidarity had financed 94% of all Haiti’s development projects up until 2015, according to former Prime Minister Laurent Lamothe, who served under Moïse’s mentor, Pres. Michel Martelly, and was also from Moïse’s neo-Duvalierist Haitian Bald-Headed Party (PHTK). Haiti’s OAS Ambassador Harvel Jean-Baptiste, who had been appointed by Moïse’s predecessor Pres. Jocelerme Privert, voted against a similar Maduro-bashing resolution on Mar. 28, 2017, making an impassioned speech defending Venezuela against the Washington-sponsored attack on its sovereignty. But on Jan. 10, Léon Charles voted against Venezuela, shocking Haitians throughout Haiti and its diaspora. 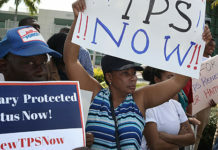 Comments and discussions on Haitian social media groups, now joining radios as a good barometer of Haitian public opinion, were almost universally outraged by the vote. “No, their colony,” replied another. “The Americans said that they would support the street demonstrations against Jovenel if his government didn’t vote against Venezuela,” opined another group member. “We can’t be our own masters when we can’t even be autonomous in our decisions,” said another. 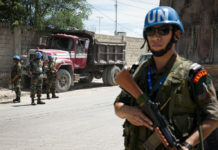 Blocked by the likely veto of Russia and China in the UN Security Council, Washington’s goal is to have the OAS invoke the Inter-American Democratic Charter to invade Venezuela with an “international peace-keeping force” under Washington’s direction, much as was done in Haiti in March 2004 after the U.S.-engineered overthrow of Pres. Jean-Bertrand Aristide. The Democratic Charter is a Washington-promoted pact, adopted on Sep. 11, 2001, which authorizes OAS military intervention if two-thirds of the OAS’s 34 active member countries vote for it. The number of votes that Washington needs is 22. “President Donald Trump is mulling whether to recognize the president of Venezuela’s opposition-controlled National Assembly [Juan Guaidó] as the de facto leader of Venezuela instead of President Nicolás Maduro, according to two people familiar with the discussions,” reported the Sacramento Bee on Jan. 15, 2019. In recent days, Venezuelan popular movements have been setting up “anti-imperialist camps” to defend Venezuela’s sovereignty, according to the news site Venezuelanalysis.com. Meanwhile, in Haiti, on Mon. Jan. 14, a delegation of popular organizations visited the Venezuelan Embassy in Port-au-Prince to denounce the Haitian government’s OAS vote and express their solidarity with Pres. Maduro and the Venezuelan people. Representatives of the Democratic Popular Movement (MODEP), KONBIT, the Assembly of Solino Neighbors, and Revolting Slaves were among the various community groups and unions which pledged to maintain their support through demonstrations, pickets, and conferences.